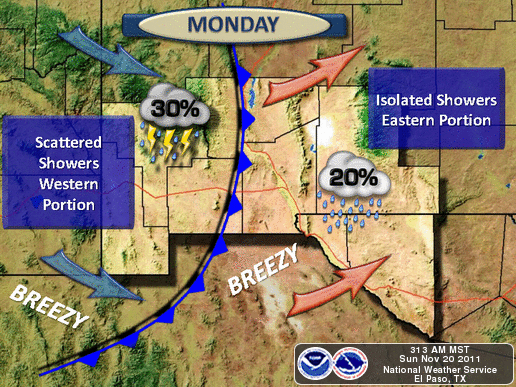 Quiet Today - Slight Chc For T-Storm Monday. Blog updated at 3:15 PM MST. 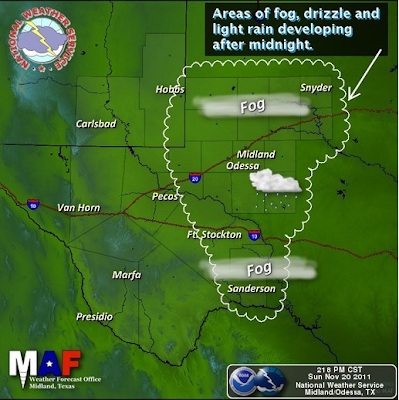 A modified arctic cold front was draped across eastern New Mexico and west Texas this morning. 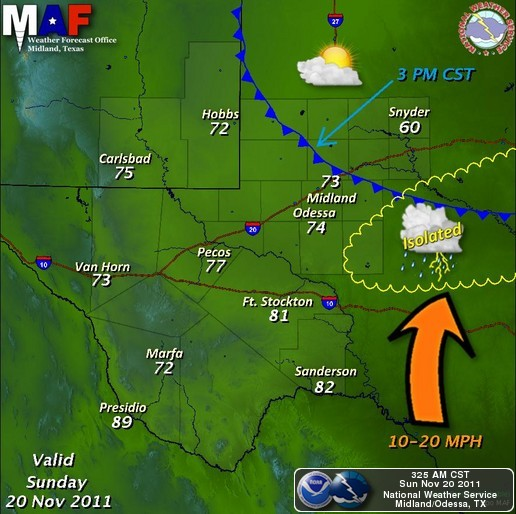 This front should stall over the area by later this afternoon. Our afternoon high temps are still forecast to rise up into the upper 60's to the low 70's this afternoon. Our next upper-level storm is forecast to swing across northern New Mexico and southern Colorado tomorrow. A modified arctic cold front will be draped across eastern New Mexico, while a Pacific cold front will approach SE NM from the west Monday afternoon. A few scattered rain showers and thunderstorms will be possible across SE NM tomorrow. Our chances for rain are not very high, only about 20%. 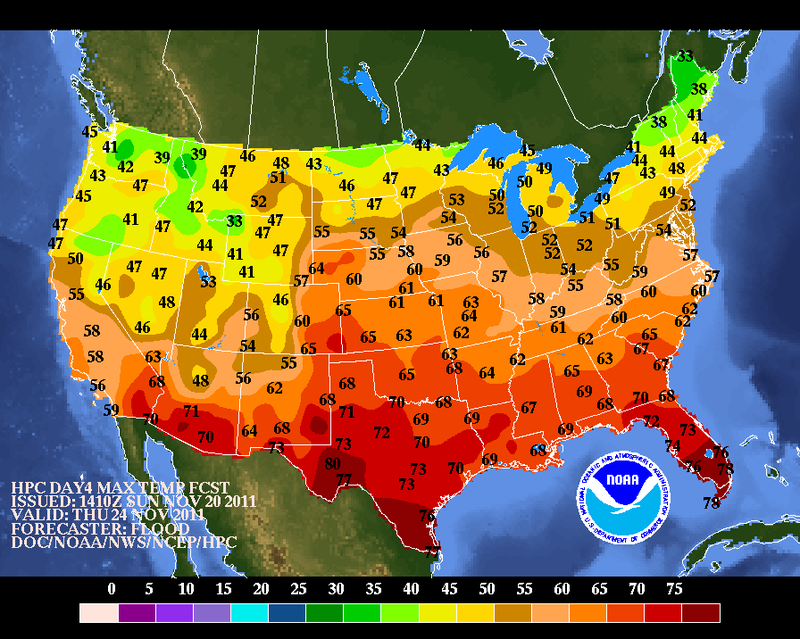 Our afternoon highs tomorrow will be close to 70. Slightly cooler air will cover the area Tuesday and Wednesday with highs in the mid-upper 60's expected. 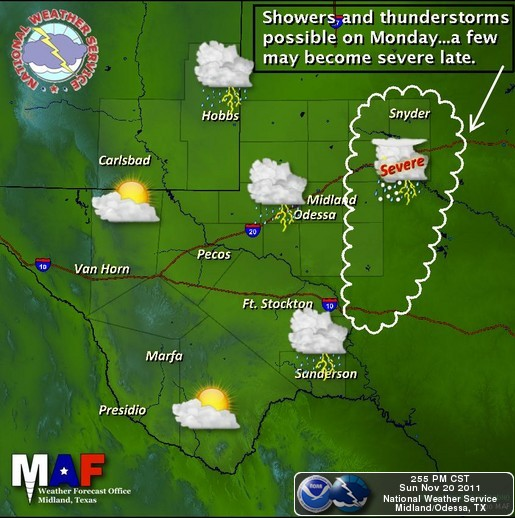 Severe Weather Possible Across West Texas Monday. 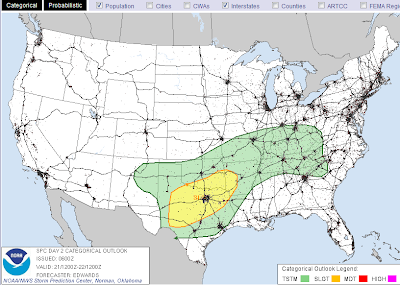 Map Is Courtesy Of The Storm Prediction Center (SPC). A combination of favorable conditions will support the possibility of severe thunderstorms across parts of west Texas tomorrow. Isolated supercell thunderstorms will be possible across parts of the eastern Permian Basin, in the Midland National Weather Service County Warning Area. 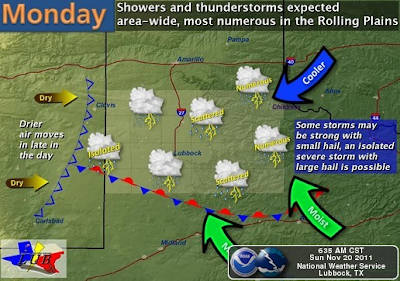 Large hail, and damaging thunderstorm wind gusts appear to the greatest severe weather threats at this time. However, there will also be enough rotation within the lower levels of the atmosphere to create a slight threat for an isolated tornado or two. Please visit these links, especially on Monday, for the latest on this potential severe weather threat. 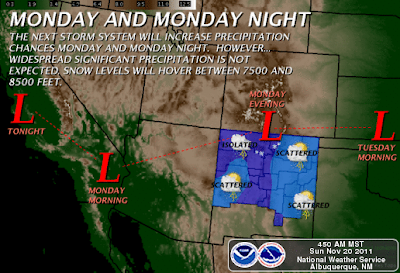 Thanksgiving Outlook For SE NM. 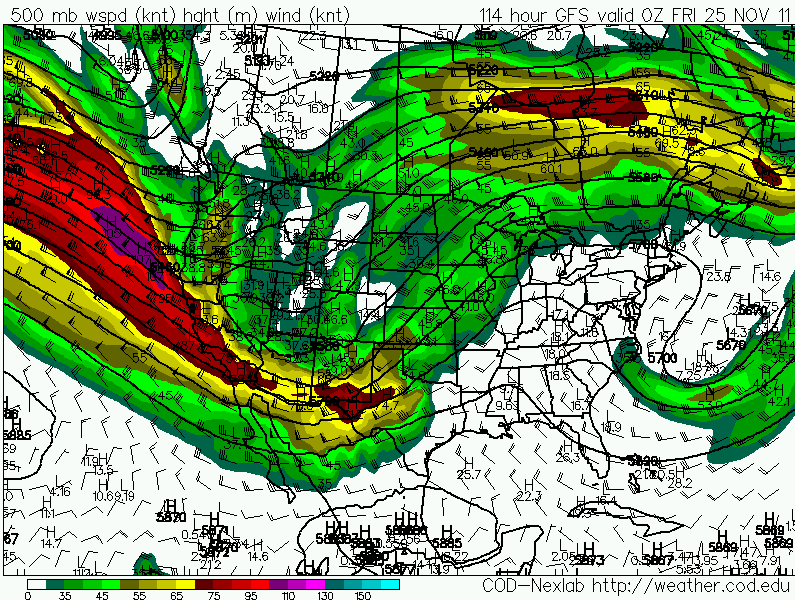 Valid At 5 PM MST Thanksgiving Day. 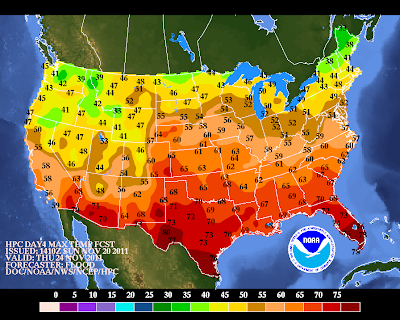 High Temperature Forecast Map For Thanksgiving Day. 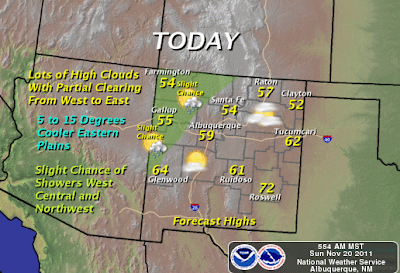 It appears that we are still looking at a warm Thanksgiving here in SE NM with high temperatures in the mid-upper 70's. A large upper-level trough of low pressure will be approaching the state, and this will likely kick up some gusty southwesterly winds across the area Thanksgiving afternoon.